Lock in a great price for The Noble Suites – rated 9.1 by recent guests! I liked the ease of booking, everything done in advance no hassle of dealing with other people, lines, check in,etc. bonus....the comfort of knowing others are around you, without having to see anyone! The Noble Suites advertises itself as a boutique hotel, and it certainly lives up to that billing. I stayed in Room 101, the Judge’s Chambers, and it was gorgeous. 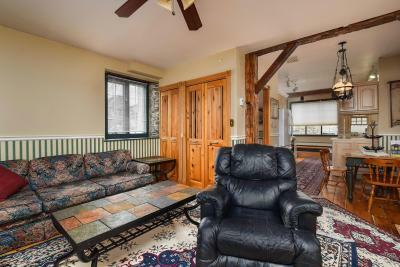 I loved all the wood and the tasteful furnishings in the main room. 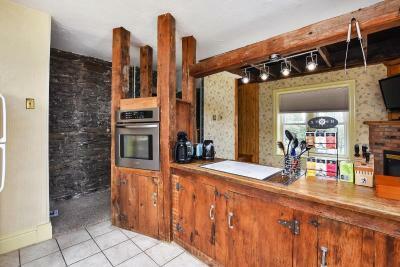 The kitchen was small, but well equipped. 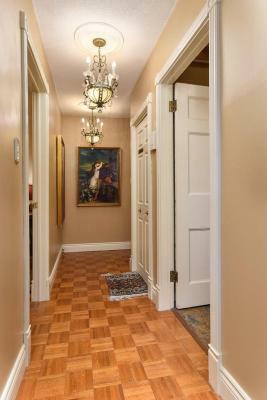 This suite had two entrances - the main one and a very convenient back door opening on to the parking area. 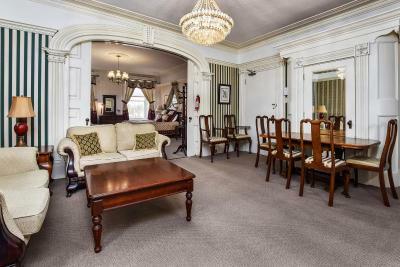 The location is amazing with the Brockville’s Main Street a 5-min walk to the north and the St.Lawrence River a 5-min walk to the south. The price was very reasonable for such a nice place. I wouldn’t hesitate to stay there again. I like the cozy comfy feel of the suites. It is almost better than home. The room was nicely decorated with beautiful decor. 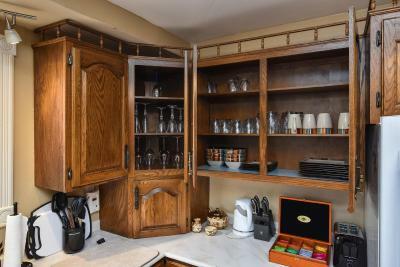 Many amenities were available including great coffee and tea selection. 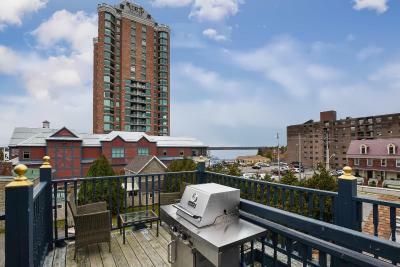 The location is within easy walking distance to great restaurants, shops, theatre, scenic waterfront, and more. 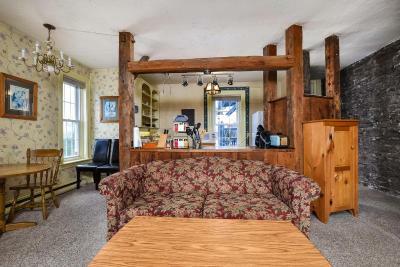 Unique and charming rooms complete with modern conveniences. Loved the location close to the water, restaurants and shopping. Such a beautiful, old, well-preserved building. Perfect place to stay. Everything! It’s a hidden gem! 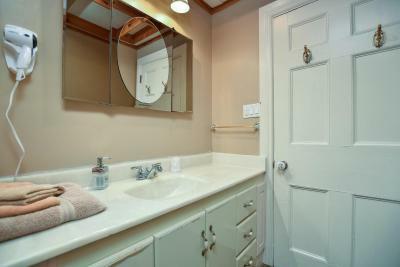 Clean, beautiful and with full amenities! 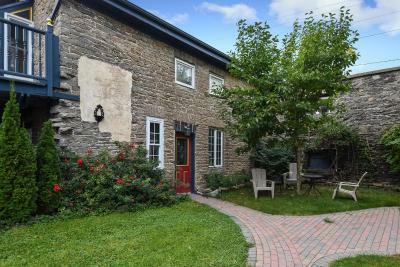 This is our fifth stay here- it makes a perfect break in the trip between Vermont and Toronto! 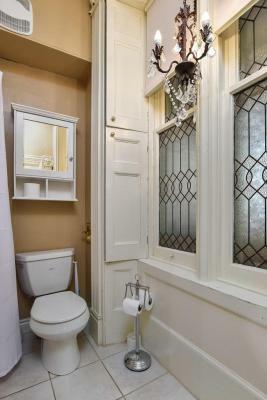 Lovely surroundings, convenient to downtown and great parking! 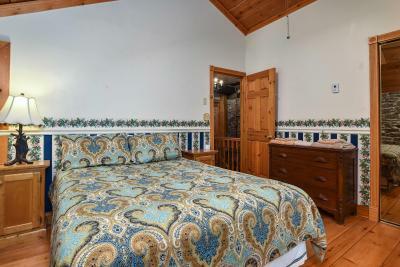 A fun room, Judges Cambers, and lots of in home amenities. The Noble Suites This rating is a reflection of how the property compares to the industry standard when it comes to price, facilities and services available. It's based on a self-evaluation by the property. Use this rating to help choose your stay! 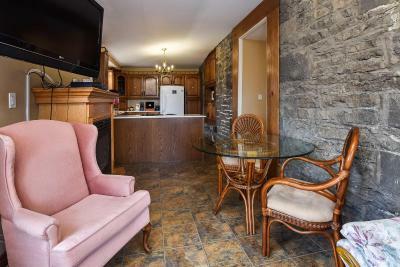 One of our top picks in Brockville.Located in Brockville in Ontario’s Thousand Islands region, The Noble Suites is a historically recognised property, fully renovated to provide guests with modern comforts and amenities. 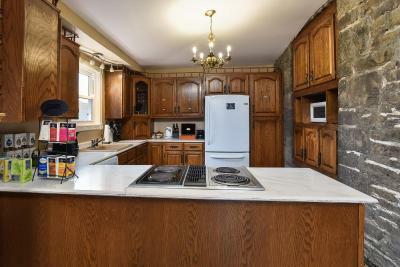 The property is situated in downtown Brockville, less than 5 minutes’ walk from local shops and restaurants. Each spacious guest suite is individually themed. 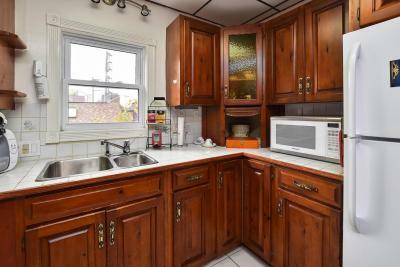 All suites include a refrigerator, microwave, kettle, toaster and gas BBQ facilities. 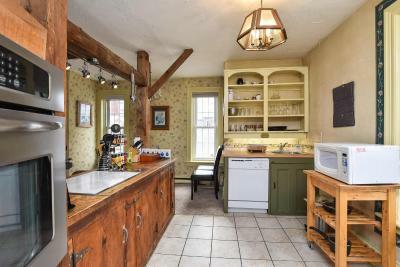 All suites except The Judges Chambers include a full-size stove and dishwasher. It has a two burner stove. Crystal wine glasses, china teacups, beer steins, cutlery and cooking utensils are provided. Guests will find a selection of teas and a Tassimo coffee maker in their room. Additional amenities include free WiFi, a large LED TV with satellite channels, a fireplace, ironing facilities and air conditioning. Some suites are equipped with sofa beds. For added comfort, the beds are fitted with microfibre sheets. 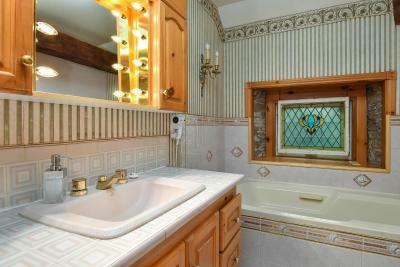 The bathrooms are en suite, and contain a bath/shower combination, complimentary toiletries and a hairdryer. At The Noble Suites you will find a well-maintained enclosed courtyard garden. On-site parking is available at no extra cost. 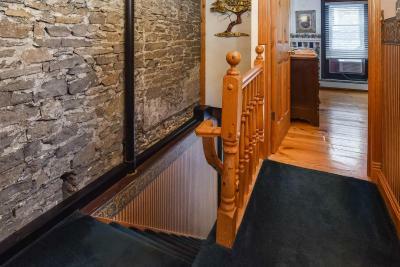 This property is less than a minutes’ walk from the Tall Ships Landing and Brockville Aquatarium. Canada's first railroad tunnel. 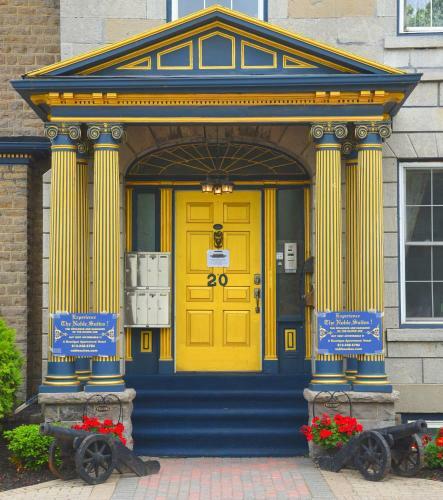 The Brockville Museum and Brockville Arts Centre can both be found within 2,300 feet. When would you like to stay at The Noble Suites? Named The Judge’s Chambers (Suite 101), this suite is on the ground floor and has 2 entrances (it can be accessed from the main hall as well as through a private entrance from the parking lot). 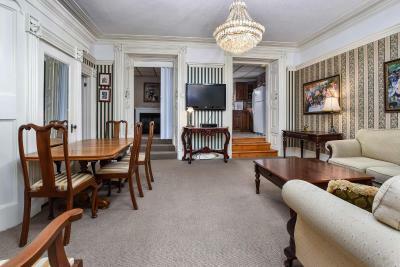 The suite features an ornate wooden ceiling, inlaid hardwood floor designs, a sculptured brick fireplace and an attractive custom-made bookcase. 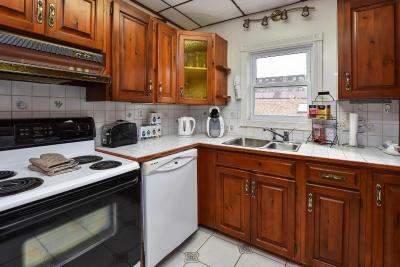 Please note, unlike the other suites The Judge’s Chambers only has a two burner stove and it does not have a dishwasher. 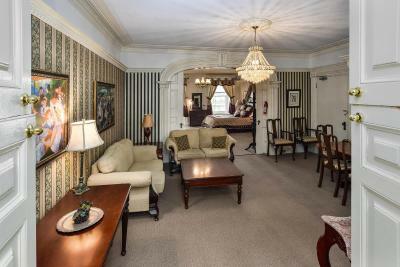 Named The Parlor Suite (Suite 100), this elegant suite is on the ground floor. It offers a street view of City Hall and Downtown Brockville. 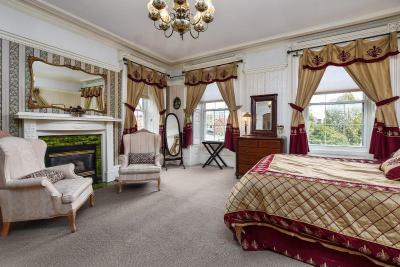 Named The Garden Suite (Suite 102), this suite features attractive stained glass windows, a large bay window, and French Doors opening out into a walled garden. A local artist was hired to paint a garden mural including birds, animals, insects and flowers on the interior walls. The kitchen is fully equipped. The living area has a pull out sofa bed (an extra charge applies if used as a bed). This suite has a ground level entrance from the parking lot, through the garden. 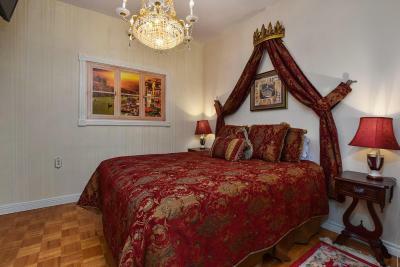 Named The Penthouse South : The Canadiana Suite , (Suite 201), this two-story suite has a queen and single bed in the upstairs bedroom and a queen-size pullout sofa bed in the lower living area. The upper sleeping area overlooks the living room below. 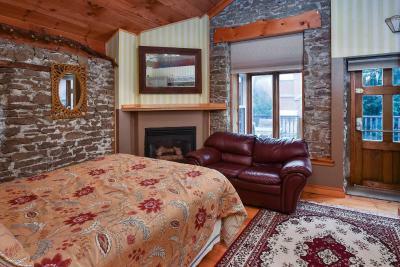 This suite has an Early Canadiana theme, with exposed stone, pine and hardwood finishings. The living room includes a gas fireplace, controlled by thermostat. Both levels of this suite have an air conditioner. 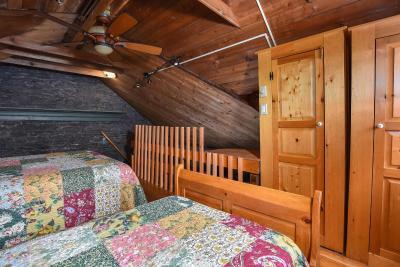 The suite is accessible from inside the house on the second floor, as well as from the second floor balcony (stairs lead up to the balcony from the parking lot). 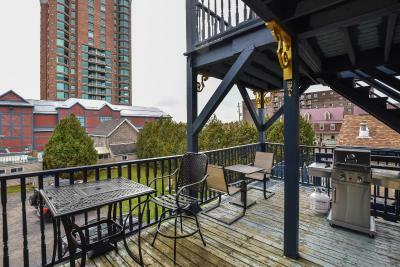 The balcony area has patio furniture, a shared propane barbecue and offers views of the river. Please note, this suite is located on the second floor and there is no elevator/elevator at the property. 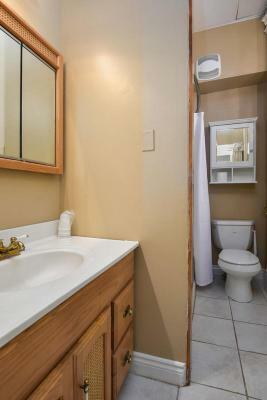 The bathroom is on the main floor of the suite with the bedroom upstairs on the second floor. 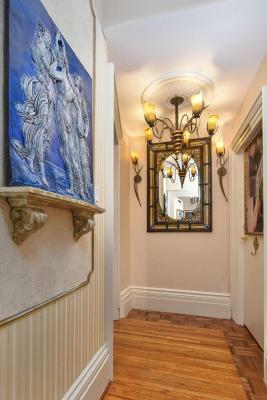 The main floor and bedroom and staircase are all contained within this single two-story suite. Named the Senator Suite (Suite 200), this two-bedroom suite has a sliding pocket door to separate the main bedroom from the living room. 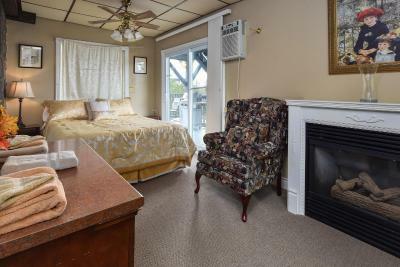 The main bedroom has a queen size bed and a fireplace. The second bedroom is on the other side of the living room. 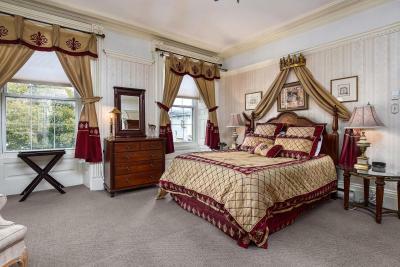 It also has a queen-size bed and a fireplace. 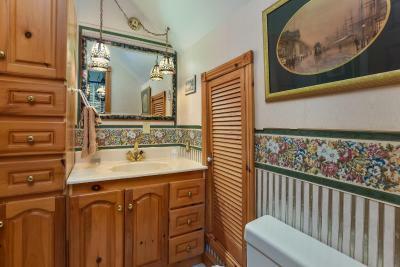 The Senator Suite has a fully-equipped kitchen and an private bathroom with a bath/shower combination. A patio door opens out onto a balcony. 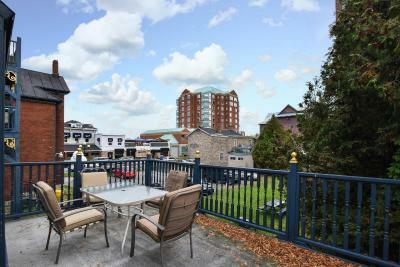 The balcony area has patio furniture, a shared propane barbecue and offers views of the river. Please note, this suite is located on the second floor and there is no elevator/elevator at the property. 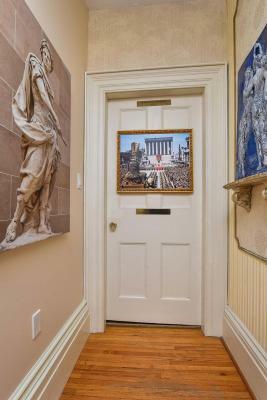 Named the Penthouse East : The Cesar and Cleopatra Suite (Suite 300), this historically themed suite contains historic reproductions and art related to Ancient Rome. Besides prints of famous art it has reproductions of the shields typically used Roman soldiers, goblets from that era, busts, portraits and DVD's of Cesar and Cleopatra movies. 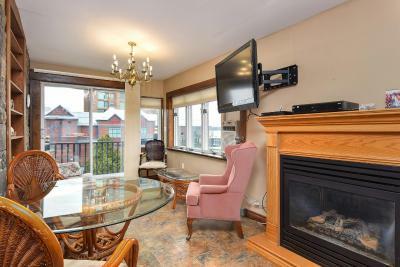 The living/dining area features a fireplace. 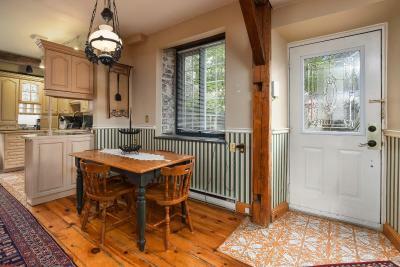 It has views of City Hall, Canada's first railway tunnel and the St. Lawrence River. Please note, this suite is located on the third floor and there is no elevator/elevator at the property. 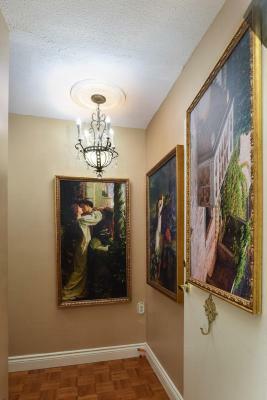 Named The Penthouse West : The Romeo and Juliet Suite (Suite 301), this historically themed suite is replete with prints of famous art relating to Romeo and Juliet and DVD's of Romeo and Juliet movies. 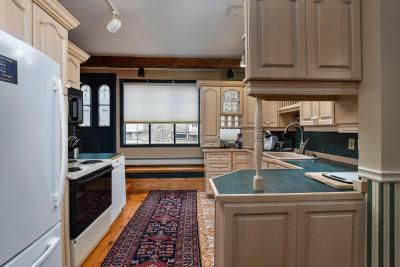 It includes a well-equipped kitchen. 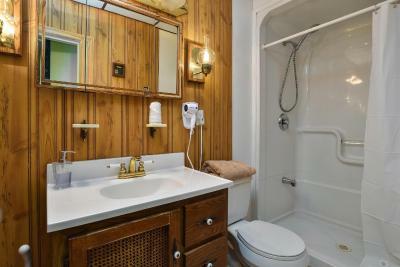 The bathroom has a tub on a raised platform and a large separate shower. The living/dining area has a fireplace and patio doors which open out onto a large private deck, offering views of the St. Lawrence River. The suite contains two TVs, one in the living area and another in the bedroom. Named The Coach House (Unit 35), this is a two-bedroom, two-story home. The entrance is accessible from the courtyard. 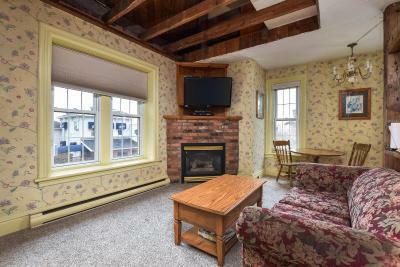 The entrance opens into the living room which includes a fireplace and comfortable seating area. 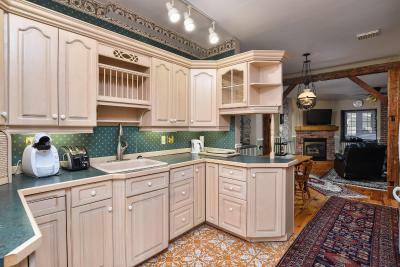 The kitchen, dining area and a powder room are also located on the ground floor. 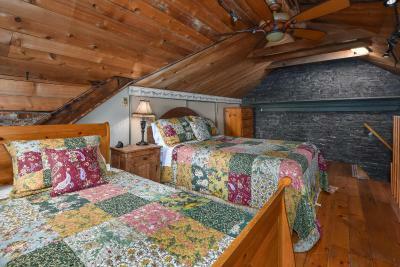 The two bedrooms are upstairs, separated by the bathroom. The master bedroom has a queen-size bed, thermostatically controlled fireplace, air conditioning and a door that opens out onto a deck. The deck has river and garden views. 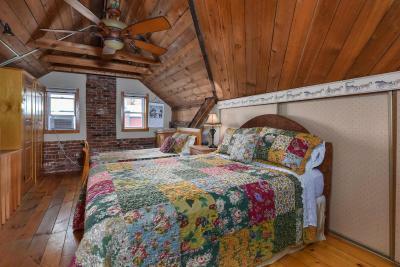 The second bedroom has a queen-size bed, a skylight and air conditioning. 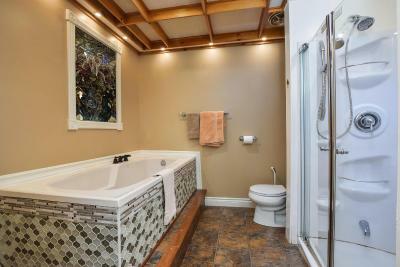 The bathroom contains a modern glass-enclosed shower and a deep soaker bathtub. House Rules The Noble Suites takes special requests – add in the next step! The Noble Suites accepts these cards and reserves the right to temporarily hold an amount prior to arrival. Please note, this is a historic building and there are no elevators/elevators on site. A late checkout fee is applicable unless late departure is prearranged ahead of time. The tv~way to difficult! Bottom line....traveling all day, finally arrive at my destination order dinner in and go to turn on the tv to relax ......Didn’t happen. *instructions for how to use the tv can be found in the welcome book.....that’s right, I said instructions....A FULL LENGTH TYPE WRITTEN PAGE WORTH! It’s hard to see how our experience could be improved upon. Loved the cosy warmth of the fireplaces in when I checked in. 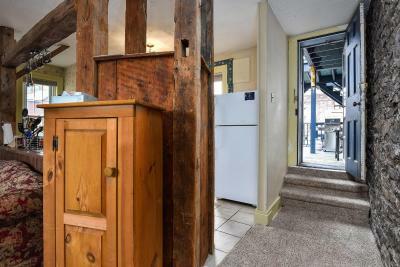 The only “complaint” was that,by necessity, there was no insulation between this room and the one above. This did not prove to be an issue for sleeping as the guests above went to bed early and got up late! However, it could be a concern. The room was well equipped and very clean. Comfortable surroundings with terrific clear guidance pages for the t.v and restaurant suggestions. The mattress was wonderful. 2nd time here and we’ll be back. 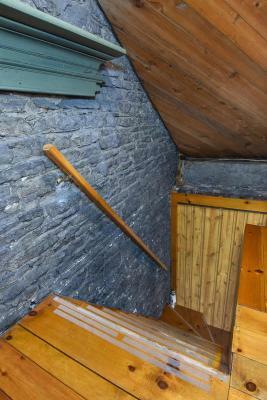 Garden suite could use towel racks and at least a small shelf for toothbrush Older guests should be aware of steep stairs in the loft In 201 suite. Soundproof not totally up to par in some units. 4:00pm check in and 11:00am check out seems a bit short. Love this place for a little weekend getaway.